This means that they’re going to have to find the right employee for the job, as well as ensuring that they come to some sort of an agreement before that person is given employment. 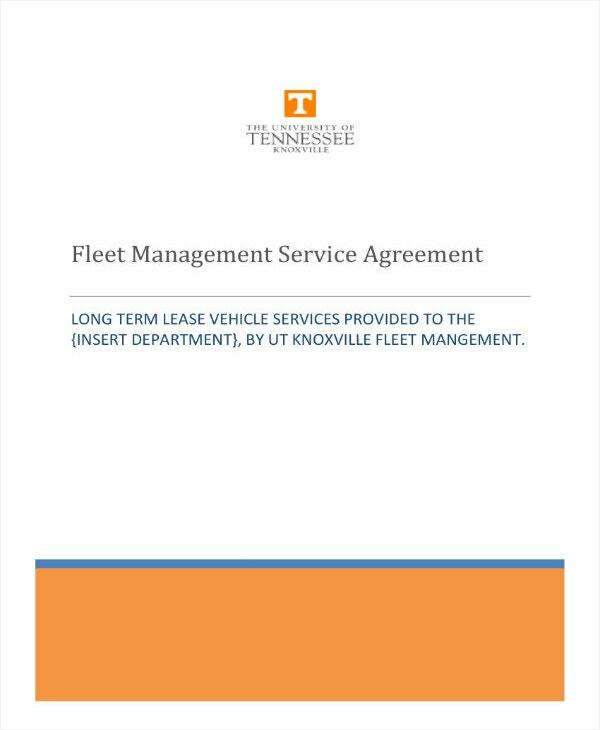 And that’s why this article is going to teach you how to come up with a fleet management contract. Take note that that the entire purpose of having this type of contract is so that you can point out all of the details about hiring someone who will be in charge of a business’s fleet of transportation. Let’s say that you were the owner of the business, then you’ll obviously want to make sure that the person you want to hire understands everything that needs to be done. So long as you are able to outline in regards to the matter of employment, then you shouldn’t have to worry too much about that. You can also check hr contract templates. 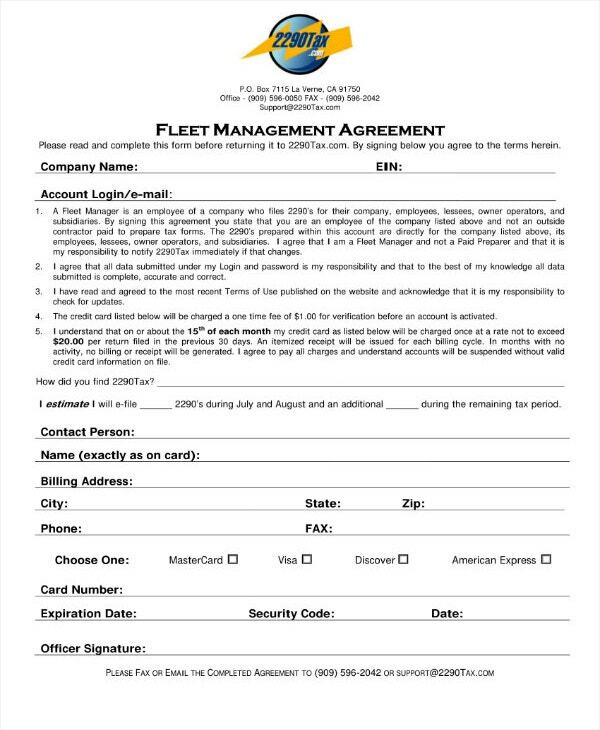 With that being said, here are the steps that will allow you to come up with a fleet management contract. 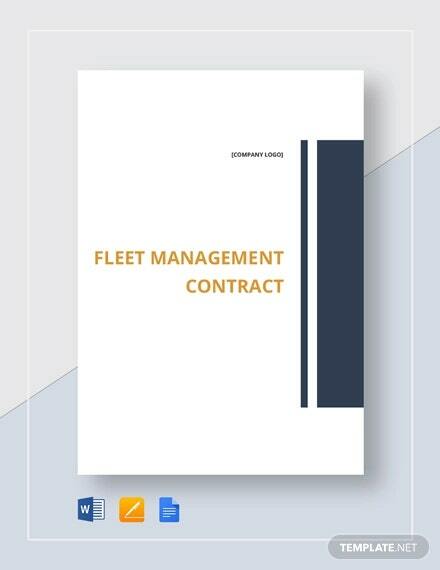 The first step that you must take when making a fleet management contract is to point out exactly who is involved in it. You’re going to need this information as there might come a situation wherein you might have to make use of it. For example, you might want to file a lawsuit on the employee that has broken the agreement templates, only that you need provide proof of that employees identity. Should that actually happen, then all you have to do is bring out the contract and show the name of the employee and his or her signature. So what you will need to do is to write down the complete name of the employee who you wish to be your fleet manager. Make sure that you include the first name, last name, and the middle initial. Place the role right beside the soon-to-be employee’s name when you’ve writing down his or her complete name. That way, one can easily identify which of the employees in your current staff is the one that’s in charge of handling the transportation fleet. You can also like construction contract templates. Then you must proceed to writing down the name of the company into the document. Do this along with writing down the name of the person that’s representing the company. Doing so will make it easier to track down the person that’s responsible of the contract’s creation and signing. Again, be sure that write their complete names to guarantee that one is able to look up information about the company or the person in charge of conducting the contract signing as easily as possible. You may also see training contract templates. 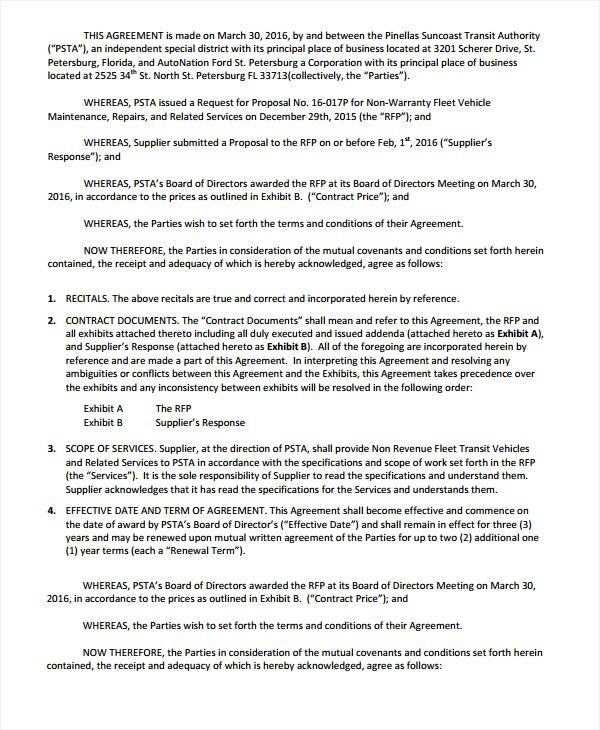 This is the part of the sample contract that will be discussing specifically what the fleet manage is going to be in charge of handling. This is very important as this particular type of employee will want to know everything that’s related to his or her duties, that includes the exact type of vehicles that need to be managed. So what you are going to have to do first is to identify all of the vehicles that your business is using for its day-to-day operations. Naturally, the vehicles being used will differ with every business, meaning that you’re going to have to learn about the ones your business uses. This means that you are going to have to provide a description of the ones that your fleet manager will be in charge of taking care of. You can also see proposal contract templates. You should figure out the legal description of every vehicle that’s going to be used by the business, and then proceed to listing them all down in the contract. Make sure that you leave out even a single one. You can also read termination contract templates. Then, you must write down the quantity of these vehicles. It ‘s possible that the fleet manager will be handling more than just one type of vehicle, meaning that he or she will want to know exactly how many need to be managed. So once you’re finished pointing out all of the vehicles that the business uses, all you have to do next is to place the amount of each. That way, the fleet manager will know exactly what he or she will need to keep track of at all times. You may also check lease contract templates. Once you’re done sharing what the fleet manager will be in charge of, then the next step is to point out exactly what the fleet manager will be doing once he or she is employed in your business. There are many different duties and responsibilities that this particular role contains. This means that you will need to be specific when it comes to writing them down as you want this particular employee to know exactly what he or she needs to do in order to meet with the business’s expectations. You can also like employment contract templates. Guarantee that all of the vehicles that he or she is in charge of are maintained at all times. In charge of scheduling when vehicles need to be scheduled for maintenance checks. Making use of fleet management software to ensure that he or she is able to keep track of all vehicles. Make sure that all of those that have been hired as drivers for these vehicles are ones that show appropriate drive behavior. You may also see investment contract templates. In charge of obtaining and disposing of vehicles whenever it’s needed. Although there are still other tasks that you can appoint to a fleet manager, it’s best that you learn more about the role first. So if you want to figure out exactly what it is that the fleet manager should be doing, then simply go on the internet and look up all of the other types of services that the role can perform. That way, you should know what it is that you have to place in this particular section of the contract. You can also read independent contract templates. It is also here that the employer should provide the fleet manager with the work schedule. How many hours is he or she expected to provide? When should the fleet manager come in? What holidays does the fleet manager get time off to? These are questions that will need to be answered in the contract. There might come a time where either party wishes to terminate the employment, or there could be situation that warrants the fleet manager’s employment to be terminated. In any case, there has to be a section in the contract which goes into detail regarding how termination works. Knowing all of the details should tell the fleet manager what needs to be done if he or she wishes to stop, or if there’s anything he or she should avoid to prevent the employment from being prematurely terminated. For example, should the fleet manager happen to break certain policies, then that could result in the employer terminating the contract immediately. So long as the details are clear and that they’re explain properly, then the parties involved should know exactly when the contract can be terminated. 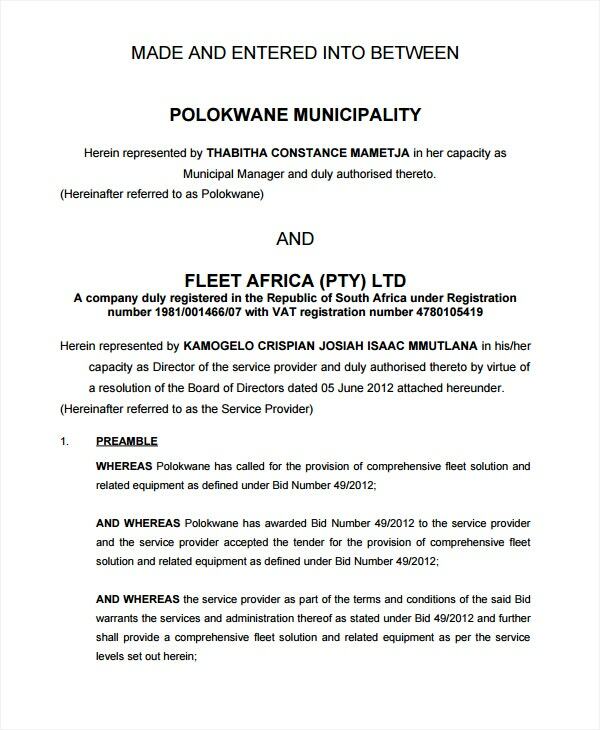 This is the section that will intrigue the soon-to-be fleet manager as it’s where all the details regarding how he or she is going to be compensated will be placed. So what needs to be done first is to provide the numbers pertaining to the amount that the fleet manager will receive. If you have no idea as to how much this particular role should make, then all you have to is to do your research to figure out the standard amount. 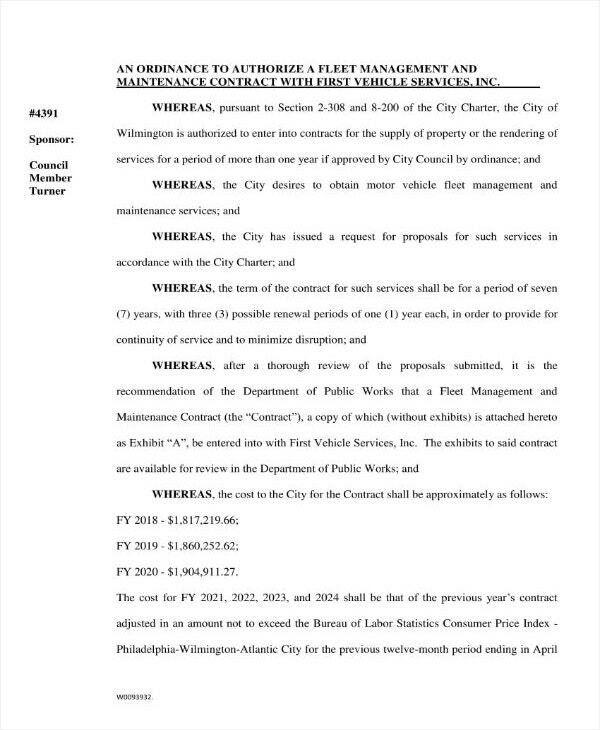 You can also like service contract samples. Then you must proceed to write about when the fleet manager should expect to be compensated. Is it going to be bi-monthly? Or monthly? Maybe even weekly? You’ll need to be very specific, meaning that you’ll want to come up with exact dates for every month wherein the employee will be paid. And lastly, explain how the fleet manager is to receive the money. The employer may decide to pay by transferring the money straight to the employee’s bank account, issuing checks, paying cash straight up, etc. It’s best to go with one that will make the business look professional, but this is ultimately up to the employer to decide. You may also like development contract templates. In the event that you would like to learn about the other types of contract samples that you can make, then all you have to do is to go through our site. It has many different articles, all of which should have the information you’re going to need. Just make sure that you read these articles thoroughly so that you can make the most out of what they have to offer.